The Jaws of Island ponds? Not quite; snapping turtles are prevalent but also much maligned. More monster sightings followed. In 1859, two frightened Gay Head fishermen claimed that they had been chased by “the veritable sea serpent” off Noman’s Land. In 1897, the officers of the steamer Gloucester saw a white serpent off Gay Head, forty or fifty feet long, resembling a gigantic eel. Most of the serpent accounts can be explained away as unusual whale or shark specimens. Or wandering oarfish: two years ago a seven-foot oarfish, normally a deep-water fish that can grow to fifty feet or more, beached itself temporarily on Nantucket. A 1937 case of sea serpents spotted off Nantucket was part of a hoax perpetrated by a pair of con artists. Professor Silliman’s vertebra, meanwhile, was likely from an extinct whale-like species known as the Basilosaurus, whose teeth have since been found in the fossil-rich Cliffs at Aquinnah. And Allen was known for his playful exaggeration and his celebration of colorful folk tales. The club was celebrated in this 1921 New Bedford Times cartoon by Reginald Tribe. In its early years the group was headquartered in the back room of Matthew Chadwick’s cigar and newspaper store, inhabited today by CB Stark Jewelers. In 1904, the forty-four-member club formally organized and elected Sheriff Walter Renear president. The club was moved to the third floor of Lane’s Block (over what is now Leslie’s Pharmacy), and in 1914 across the street to the corner of Main and Church Streets (where Off Main is today). Besides Fisher and Renear, early members included Presbury “Pres” Luce, Captain Hartson Bodfish, Brad Manchester, “Boots” Andrews, Peter Cromwell, Captain Gilbert Smith, Captain George Fred Tilton, and many other notable characters of the day. The club was important enough that in the fall of 1915, when gubernatorial candidate Samuel McCall and his running mate Calvin Coolidge campaigned on the Vineyard before the 1916 elections, their six-town tour ended with a grand reception at the Barnacle Club. McCall soon became the forty-seventh governor of the Commonwealth, and Coolidge, of course, eventually went on to the White House. The Barnacle Club also served as a museum of sorts, its dusty windows a collecting place for curiosities from around the globe. Accounts from the 1920s mention the stuffed wolverine brought back from the Arctic by Captain Tilton, a golden eagle captured by Gardiner Greene Hammond, a kudu’s horn from Africa, an old Chinese writing desk with a secret drawer, and part of the old telegraph cable that ran from the mainland to the Vineyard. About 1918 Bozzy arrived. The alligator, then about thirteen years old and perhaps two feet in length, was named for the tug Boswell on which he arrived from the Florida Keys. Under the gentle care of George “Goody” Fisher, he soon took the role of the club’s mascot from Spike, a dog who spent his days sleeping on the clubroom floor. On warmer days Bozzy would be found dozing in a pan full of warm water (changed by Fisher five or six times a day) in the club’s downtown windows. At night and in the winter Bozzy slept behind the big base burner stove. At various points the Barnacle Club was home to multiple alligators and species of turtles. Fisher had spent time in his youth as a steamboat hand, but he had spent most of his adult life on dry land – as a Vineyard Haven meat market salesman and then as the club’s custodian. 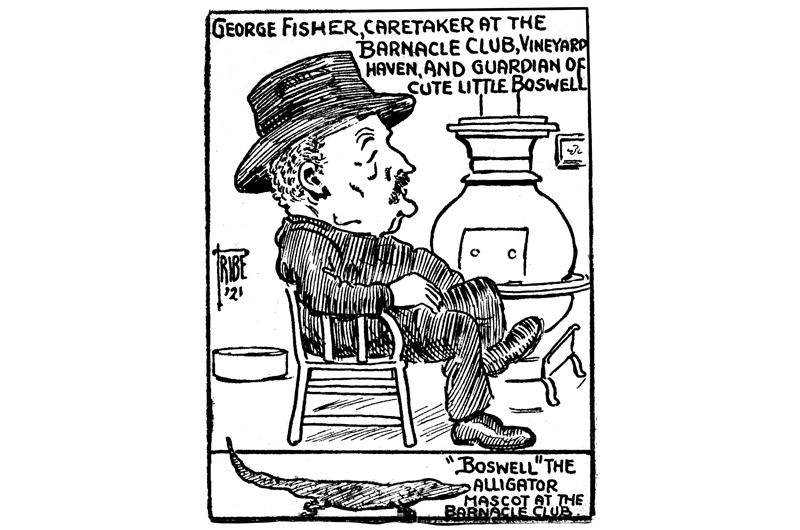 Fisher “simply dotes on alligators,” wrote the Gazette in 1921, as he demonstrated how Bozzy enjoyed being flipped over and having his stomach and throat stroked. Saturday Evening Post during the late 1910s and ’20s, and he became a syndicated cartoonist in the ’30s.) The two alligators would sun themselves together in the club’s wide windows. “They love each other now,” noted the Gazette in 1921. “If one alligator is removed to another part of the room, he croaks like a frog until his chum answers.” In 1922, two more alligators were presented to the club by summer Edgartown resident Julien Vose, a piano manufacturer. These two unnamed gators, both hatchlings less than a foot long, had been sent to Vose by parcel post from California. 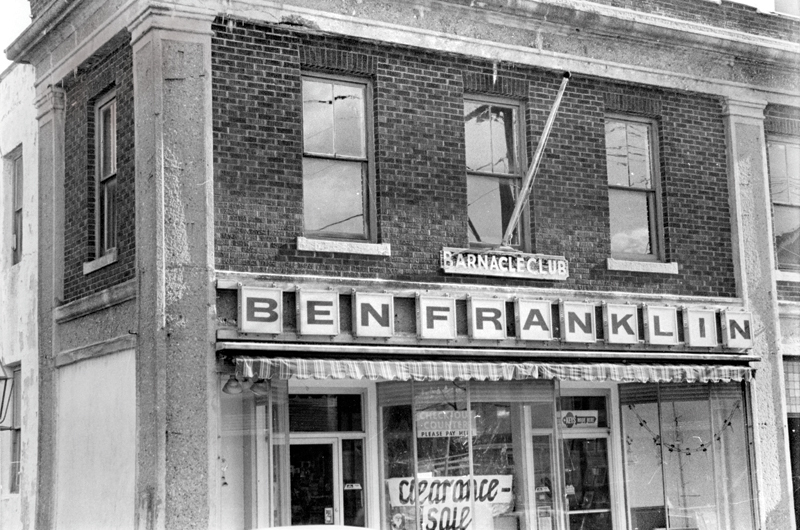 the street to the second floor of Cromwell’s Hardware (later Ben Franklin and today the Green Room). Rather like barnacles, the club would stick to the upper decks of this building for more than a half-century. Garters are the most common of seven species of snakes native to the Vineyard. 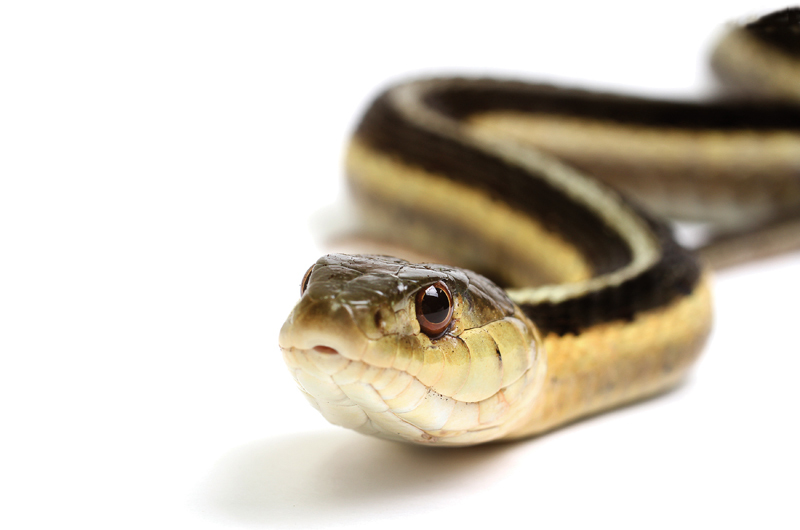 Today there are seven species of snakes native to the Island, none poisonous, and some quite rare: the black racer, the green snake, the Eastern milk snake (or kingsnake), the ring-neck snake, the ribbon snake, the garter snake, and the red-bellied snake. There are also a variety of pet snakes of other species in significant numbers on the Island. In 1971 the Gazette reported a sighting of a five-and-a-half-foot boa constrictor swimming in Chilmark Pond. The young snake, named Shunga, was fortunately chaperoned by her owner, a weekend visitor from New York. Of the native snakes, black racers, sometimes referred to by older Islanders as blacksnakes, are the largest and can measure as long as six feet. “Instances are known of snakes of this species entering farm buildings to rob hens’ nests,” read a Gazette account in 1929, after a huge black racer was discovered in a tree in West Tisbury hunting fledglings. Mal Jones of West Tisbury recalls an old story police chief George Manter once told him about how black racers were collected from stumps in an old Native American tradition. Known as stump eels, the serpents were caught to be eaten. Although turtle life spans are notoriously difficult to determine, box turtles are arguably the longest-lived animal species on the Island. In 1932, a box turtle in West Tisbury was discovered to have “T.A.W. 1861,” “L.P.L. 1861,” and “J.B.M. 1881” carved into its shell. In the 1932 Gazette article, Jerry B. Mayhew admitted to etching his initials into it a half-century prior, and the other two carvers were identified: Thomas A. West and Lewis P. Luce of Tisbury, who both enlisted in the Army and had evidently carved their initials into the shell shortly before leaving to fight in the Civil War. (Neither returned. Luce died of exposure at Baton Rouge in 1863 and West was killed in the Third Battle of Winchester, Virginia, in 1864.) 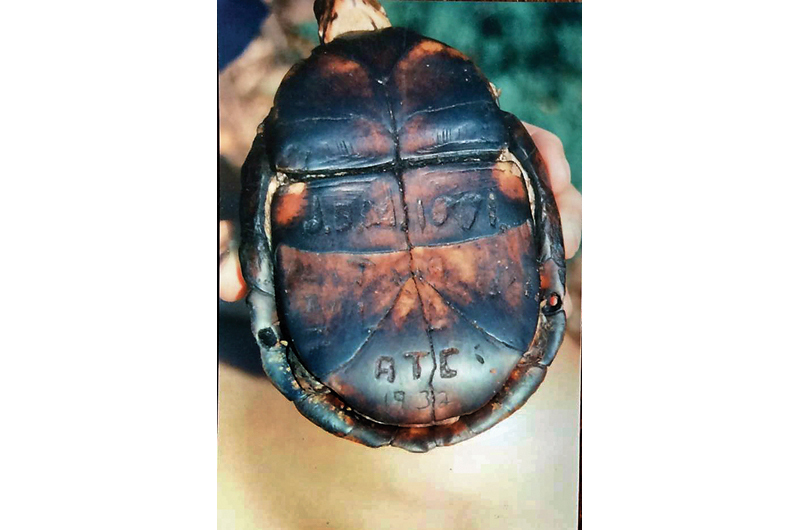 The same turtle showed up regularly in the West Tisbury yard of Tom Hodgson from the late 1980s into the early 2000s, with additional carvings dated 1932 and 1955, implying an age of more than 140 years – a longevity record for box turtles. A box turtle inscribed with initials of Islanders is said to have lived more than 140 years. Snapping turtles – known on the Island by the misnomer loggerheads (not to be confused with the sea turtles of this name) – are the largest of the Vineyard’s land-based turtles, with specimens weighing up to sixty pounds. Feared for their formidable beak-like jaws, and blamed, mostly unfairly, for preying on ducks and geese prized by sportsmen, they have been widely hunted. Legend has it that Dodger’s Hole on the Oak Bluffs–Edgartown line (originally known as The Dodger Hole) was named for the act of dodging snappers. Like black snakes, snapping turtles were once hunted – and still are, in some areas; it remains legal to hunt snapping turtles in Massachusetts with a fishing license. Amos Smalley of Gay Head, famous for harpooning a white sperm whale in 1902, was also remembered for hunting snapping turtles for profit during slow winters. Using a long pole and a hook, Smalley and his brother Frank would locate sluggish snappers in the mud and haul them up. The late Craig Kingsbury of Vineyard Haven hunted snappers as well, using baited floats. The turtle hunters would pack their catch live in crates and ship them to buyers in Philadelphia, New Jersey, and the Midwest for twenty cents a pound. “Snapper soup is a big deal in those parts,” he recalled.